Mirror's Edge Catalyst is just a couple of months away, and as Shaun said last week, that means it's time to start looking more closely at what the game has in store. To that end, EA has put up a new developer diary that digs into “the fluidity of movement,” and more precisely, how the gameplay in Catalyst will differ from, and be similar to, that of the original game. The biggest change, as animator Emil Nilsson explains, is the addition of “free roaming,” without levels or loading screens. But that doesn't necessarily mean that all roads lead to Rome. 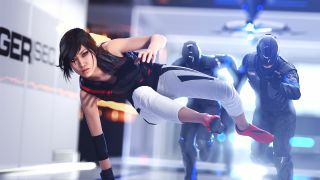 The apparent emphasis on combat remains a little off-putting, but Phil had a closer look at Catalyst last summer and came away pretty well impressed, saying that “the basic tenets of what made Mirror's Edge so good” were all present in the demo. He also took note of EA's focus on “fluidity," which is clearly a point it wants to ensure nobody misses. Mirror's Edge Catalyst comes out on May 24.